VIVO Media Arts is one of the few local organizations that has not accepted money from the Cultural Olympiad in town during the 2010 Olympics. 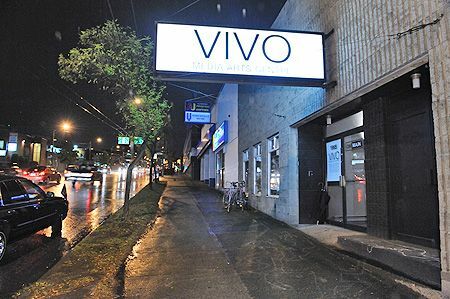 The Vancouver Media Co-op talked to VIVO's Nicholas Perrin about the junctures between art and the Olympics industry. 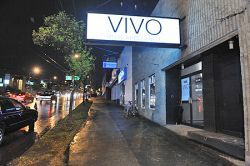 For more info on VIVO's programming during the 2010 Olympics, visit thier website. To the regret of organizers, the 21st Olympic winter games in Vancouver have refractory competition. Five days before its opening, unemployed-, activists and community-groups will start a "Poverty Olympics" in the western Canadian metropolis as already happened in 2007 and 2008. Its relay race began on Sunday. The goal of both actions is to move the social misery and massive indebtedness surrounding the prestige-project into the limelight. The self-styled "world-class province" is also "world-class in poverty." If there were gold medals for macabre records in the social realm, then the province of British Columbia should already be crowned the "winner", says Trish Garner, an organizer of the protests. British Columbia has Canada's highest rate of poverty at 15.65 percent. 643,000 residents lived in abject poverty in 2007. Their number has increased in the last two years because of the recession and budget cuts. The province is also frontrunner for the sixth consecutive year in child poverty. Despite the economic prosperity, 156,000 children, 18.8 percent, were stricken by poverty in 2007 according to the annual report of First Call published in November 2009. The national average is 15 percent. The regional minimum wage is jointly responsible for this since it amounts to only eight Canadian dollars per hour while $9.50 are paid in Ontario and Newfoundland and even $10 in the northernmost province. British Columbia posted an above-average increase in the unemployment rate with a leap from 5.3 to 8.4 percent in 2009. The situation of the affected was intensified by many cuts in the education- and public health systems, social benefits and legal aid. The main reason was the escalating cost for the Olympic structures. One year ago the Vancouver city council unanimously approved a rush order that changed local laws and changing the obligation to a civil referendum so the province could take a loan against the will of the population and gain 273 million euro to complete the works before the start of the games. Financing the Olympic Village has long been out of control. Its construction costs escalated 16% to 540 million euro. Since October 2008, the community had to pay the open bills of the Fortress investment fund which refused further payments to the developer Millenium Developments. After a first cost explosion in July 2007, the city government under the former center-left mayor Larry Campbell gave a completion guarantee and accepted a guarantee of up to 130 million euro. His successor Gregor Robertson holds to this line and relies on the absolute majority of the local party "Vision Vancouver" founded by Campbell in 2005. Projects like shifting the stadium roof devour enormous sums of money. The two thousand homeless in the Vancouver area can only dream of such sums or the comfort of athletes' housing. Many of the 1100 apartments built on the banks of the False Creek River should be converted later into private luxury apartments. According to a study of the University of British Columbia, the number of people without housing more than doubled from 2002 to 2008 - despite the economic growth. In the whole province, ten thousand people have no roof over their heads. There are "more homeless than athletes," the organizers of the Poverty Olympics declared in an open letter. They recalled the population's approval of the games was only gained through "brazen promises" to expand social housing construction, reduce the number of homeless and prevent social repression at the expense of the poor." The opposite actually occurred. One could learn from the past. In its time, the building costs for the 1976 summer games in Montreal also exploded and at the end amounted to ten-times the originally planned sum. The last credits were paid off in 2007 by the national Canadian government. Because of the mis-allocation, many Canadians today call the oval Montreal Olympics stadium "The Big Owe." Under the motto "Ending Poverty is not a Game," the anti-Olympics will take place on Sunday February 7, 2010 in Japan Hall in Vancouver's poorest downtown eastside quarter. After singing poverty songs and hymns, there will be tests of strength like "welfare hurdles" and "poverty avoidance skating." Fans and marketing articles will be parts of the "Poverty Olympics.' Winter sports enthusiasts will have the choice between three alternative mascots from the daily routine of the western Canadian lower class: "Itchy," the bedbug, "creepy," the cockroach and "chewy," the rat.